The Farm cats were sent samples of cat food to review and I’ve interpreted their tastings. 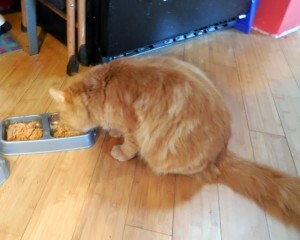 I was NOT going to taste test the cat food. They nor I received any monetary compensation for this post. The Farm cats are a hungry bunch. If I don’t have their food down at what they consider to be the appropriate times of day I hear about it. When the four of them chime in at once it can get a bit loud. Fortunately I was able to quiet them down this month with some tasty samples from Chewy.com. Hooray for happy Farm cats! What did the trick? Purrfect Bistro from Merrick. 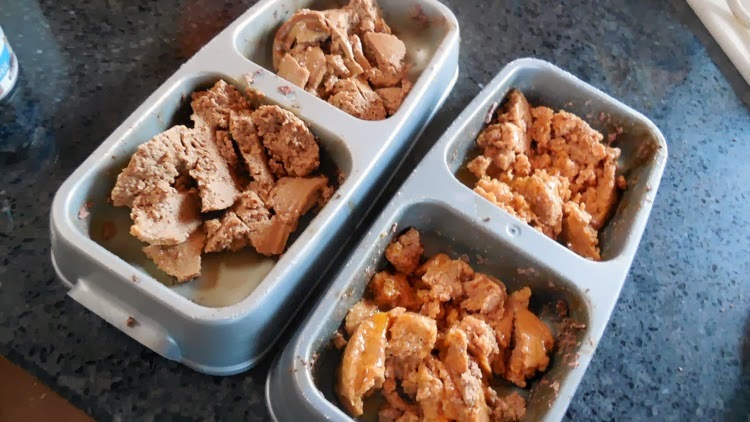 These little cans of stinky goodness had the Farm cats munching happily away and silence – except for the sounds of lapping tongues – reigned in the kitchen. 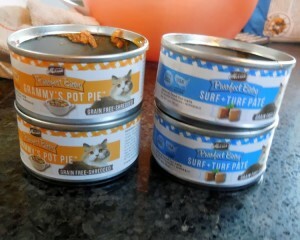 They were able to taste test Grammy’s Pot Pie and Surf-Turf Pate. 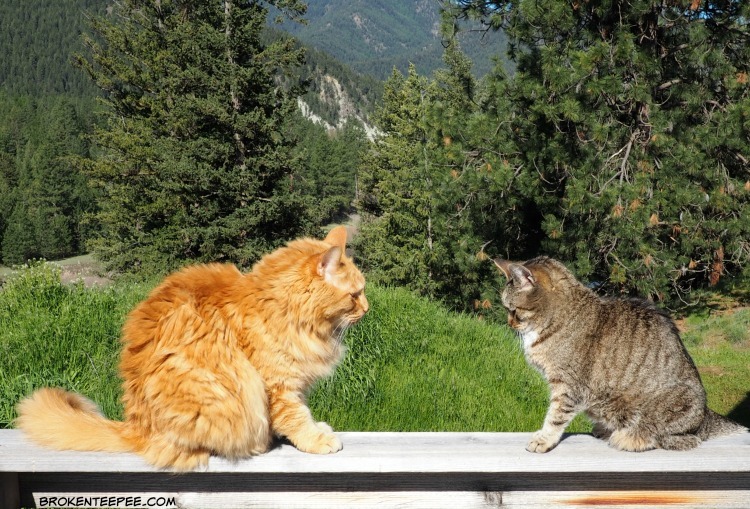 Both were appropriately stinky – not enough to gag me but odoriferous enough to make the kitties happy. They came running. Now my little furballs do not eat happily together. It’s rare that two of them will share the eating space. So the fact that Pumpkin and Harry are in the same photo here is AMAZING. Pumpkin was whipping his head back and forth – he couldn’t decide which one to eat first. He would nibble a bit of one then go to the other. He is my fussiest eater and he ended up eating a fair bit of both flavors. 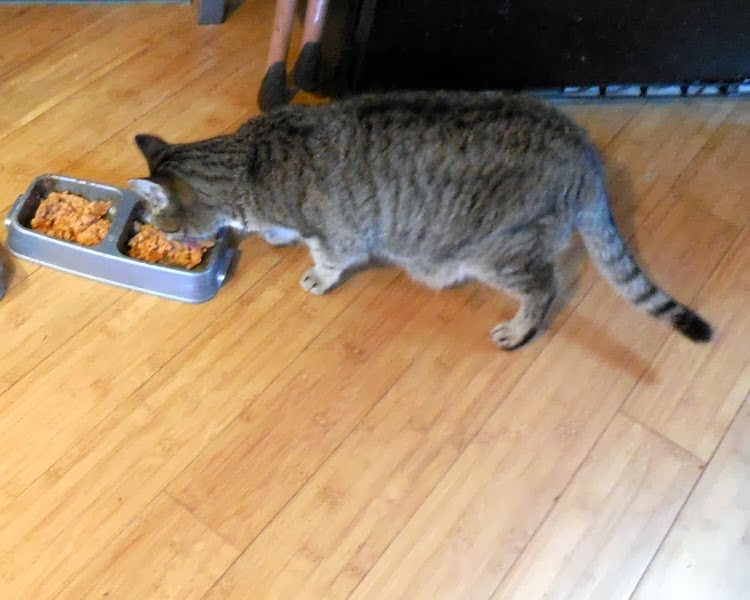 Harry will eat anything – he is my mouser and loves mousie brains so when it comes to inside food he is not fussy. Sherpa enjoyed them too. He is not really picky either but every now and again he’ll turn his nose up at something. But he loved the Purrfect Bistro. Stinky is my old lady. 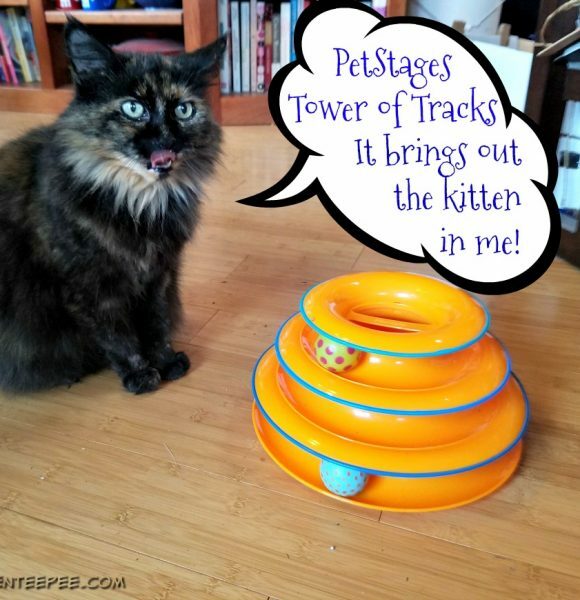 She is very particular and prefers the “premium” type cat foods. She gobbled the pate down but wasn’t as thrilled with the “pot pie.” That doesn’t mean she didn’t eat it, just not with the same enthusiasm. So all in all the Merrick Purrfect Bistro foods were a big hit with the Farm Cats. I think if they were in charge of their menu options these would appear nightly. 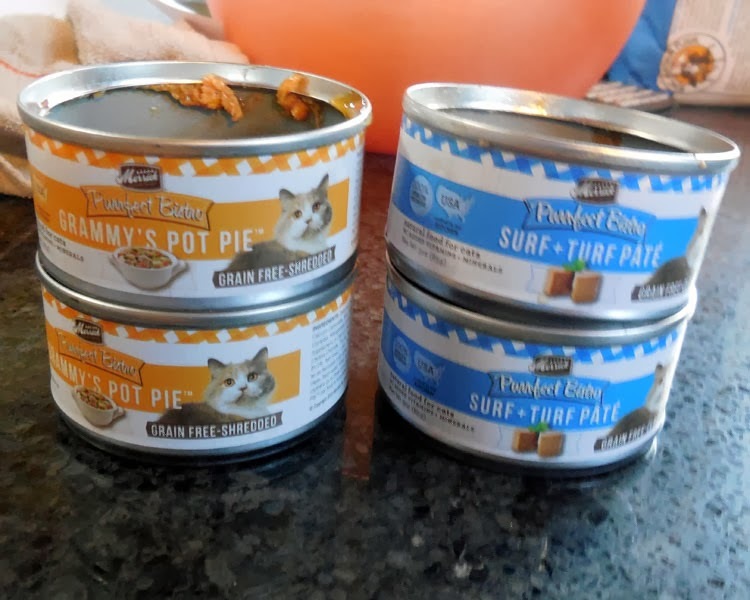 They want to send a big MEOW of thanks to Chewy.com for sending them this tasty treat. 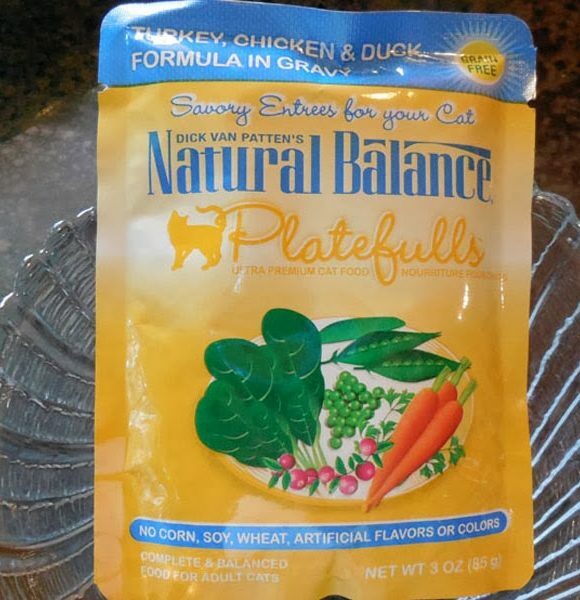 Humans should know that the Purrfect Bistro foods are grain free and there are a variety of pate, sliced and chunky type canned foods as well as a line of kibbles to suit the various needs of your kitty(ies). Chewy.com offers free shipping at $49 and you can set up an autoship system for the food you need on a regular basis. 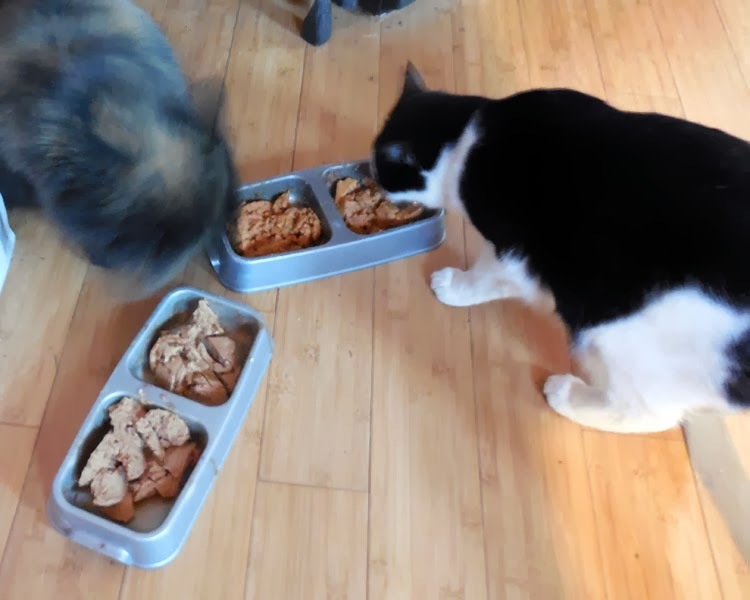 Disclosure: The Farm cats were sent samples of cat food to review and I’ve interpreted their tastings. I was NOT going to taste test the cat food. They nor I received any monetary compensation for this post. Welcome to The Great Turkey Escape Giveaway Hop!